Microsoft Corporation (NASDAQ: MSFT) today unveiled a brand new version of the Surface tablets, which was running on the full version of the Windows 8.1.The thinnest and lightest tablet yet from Microsoft has apparently killed the Windows RT with a full version of the Windows 8.1 running on it. Windows RT was initially launched to support the mobile devices having the ARM processors in them. It was specially made for the 32-bit little power and processing based devices, including Surface 2 that was launched back in the year 2012. The Surface 3 tablet that has been launched by the Microsoft houses 10.8-inch ClearType display with a resolution of 1920×1280 pixels having a ratio of 3:2. The thinnest tablet from Redmond giant also has a support for 10-point touch input and the Surface Pen, the powerhouse for this device is an Intel quad-core Atom x7-Z8700 processor a.k.a Cherry Trail clocking at 1.6 GHz with turbo boost up to 2.4 GHz. 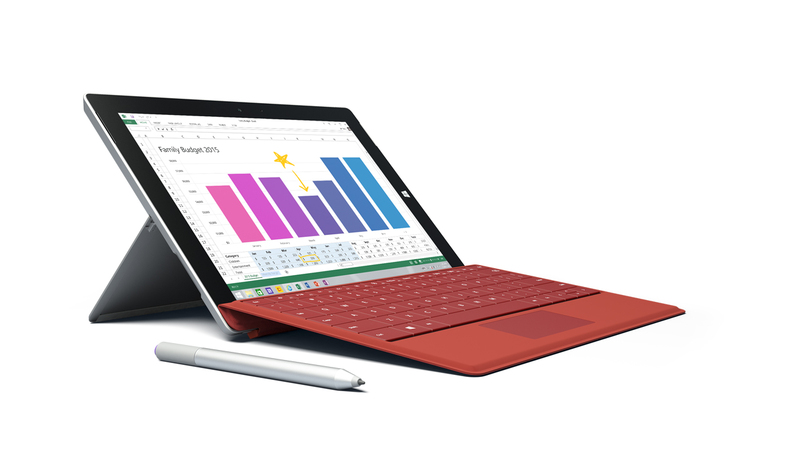 Microsoft Surface 3 tablet is going to be shipped in two flavors, one with 64 GB of internal storage, another with 128 GB. The 64 GB model will be having 2 GB of RAM, whereas the other one will have 4 GB on board. There is a 3.5 MP camera on the front, and 8 MP rear camera with autofocus. The tablet also houses Dolby audio, Bluetooth 4.0 and Wireless AC as connectivity options. Microsoft has also added a standard USB 3.0 port, microSD reader and a mini display port for to project the screen during a presentation. However, coming back to the death of Windows RT, it can be explained as users were not that much attracted towards RT version of the Surface, and other companies weren’t interested in manufacturing products based on the Windows RT. Some of the major PC manufacturers already abandoned, and shifted the focus towards low power Windows 8 and 8.1 devices. Is this a typo, “…one with 64 GB of internal storage, another with 128 GB RAM…” I can’t imagine this tablet having 128GB of RAM. That’s because it’s full Windows. The processor is almost as powerful as Core M. Things are really getting portable. I don’t think you are reading that right. 128 GB for a HDD would certainly fit, but 128GB if RAM is quite a bit for a portable device. That would be considered beefy by server standards much less a tablet. By the time I read the article typo was already fixed. I didn’t see the RAM in the original and ignored it in your “”.